This kit includes a fuser, plus a transfer roller and pickup rollers and separation pads for the manual feed tray and cassette tray. For use in HP LaserJet P3005 series, HP LaserJet M3027mfp, and HP LaserJet M3035mfp. You can save money by purchasing the fuser on exchange. See exchange details further below. Alternate parts numbers: RM1-3717. Maintenance kit, exchange. PrinterTechs compatible fuser. LaserJet P3005 M3027 M3035 series. Maintenance kit, no exchange. PrinterTechs compatible fuser. LaserJet P3005 M3027 M3035 series. This kit includes a fuser, plus a transfer roller and pickup rollers and separation pads for the manual feed tray and cassette tray. 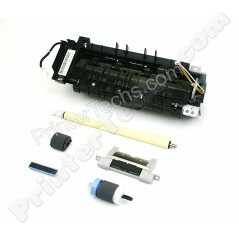 For use in HP LaserJet P3005 series, HP LaserJet M3027mfp, and HP LaserJet M3035mfp.